House Tour: Dramatic & Airy Modern Remodel — KTJ Design Co.
Fortunately, the remodel was completed just in time for Christmas dinner, and it came out marvelously. My color palette was a classic black and white motif, a nod to classy tuxedo kitchens, with a chic and modern flair. If you read my post about remodeling my 1950’s kitchen, you know that the work flow of my kitchen was all wrong and that two cooks were stumbling over each other with the stove, sink and dishwasher all in one corner. To remedy this, I designed the kitchen with two long work planes. One side has the stove and sink, and the other side has the oven and refrigerator. The corridor is wide (6 feet to be exact) so two cooks can easily pass each other and work at both ends. I chose white high gloss cabinets on one side of the kitchen and added integrated refrigeration and an oven. I like the openness of glass front cabinets for displaying dishes and glassware. Everyone always wants to “knock out a wall” and create a giant great room, but I don’t think that layout is always the best—and certainly wasn’t for my situation. Instead, I created more openness by integrating a small bar area into the kitchen / dining room wall. The bar features a live edge slab two counter-height stools (placed in the living room). On the opposite side of the kitchen, I placed a bank of black, full-height (no drawers) cabinets. The shelves of each cabinet roll out like drawers. I chose a white subway tile with a jagged edge and a slight wavy texture, accentuated with black grout, for the backsplash and hood vent cover. The countertops are white quartz. 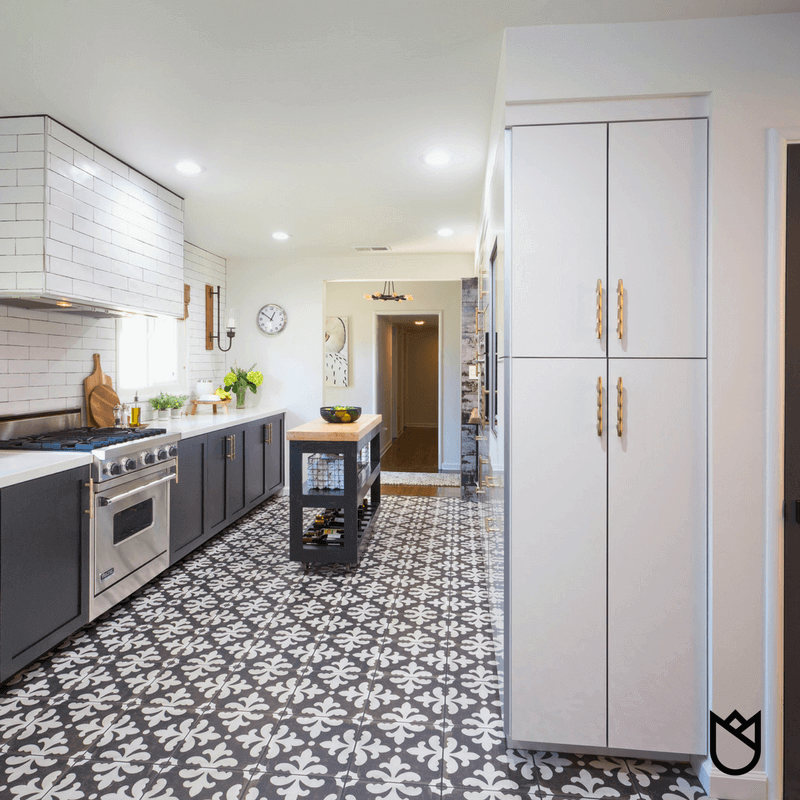 The kitchen floor is easily my favorite feature of my entire remodel: Black and white fleur-de-les cement tiles! I love how this flooring ties everything together (and camouflages the black and blonde Labrador dog hair... #reallife). This rolling island is perfect because it was custom designed utilizing the old butcher block counter that was in the old kitchen. Gold cabinet hardware and a stainless steel sink add just enough bling to offset the white, gray and black. Lastly, I accentuated the kitchen design with touches of natural wood in the live edge slab, wooden candle sconces, and other elements of wood décor, like woven wood shades. I love how this space fills with natural light. It makes me feel happier just walking into the room—and that is exactly what a remodeled space should do for you! I need to be honest here: It was never my intention to re-finish the wood floors in the living room. My home has original white oak solid wood floors, and I love them. As work progressed with the kitchen, however, I decided they needed to be refinished. I wanted to stain them a walnut color to contrast with the black and white kitchen. Since I was living in my home during the remodel, it was a little tricky moving furniture from one room to the next, but we did it. To reface the fireplace, I picked these metallic, large format tiles. The original brick fireplace had coats of paint covering its surface, so figuring out how to get the tile to stick to it took a bit of carpentry ingenuity. Between my tile setter and carpenter, we figured it out. I flipped the orientation of the living room and added a TV above the fireplace, a live edge wood desk, and custom bookcase. The walls, ceilings and trim are all Benjamin Moore White Heron., which confused my painters because they are so used to painting the walls one color, the trim another color and the ceiling yet another color. I believe that painting the walls, ceiling and trim one color makes the space feel more expansive and uniform. It also gave me a blank canvas to decorate. In contrast, I painted all the doors a deep charcoal: Benjamin Moore Wrought Iron. The door hardware was then changed to black—adding a dash of drama in my otherwise airy space. I followed up the new paint and layout with brand new furniture, window treatments, and light fixtures. It was just as exciting as any of my client projects, and I’m thrilled with how it all came together. The powder room got the royal treatment with gold wallpaper, gold plumbing fixtures and a fancy piece of artwork. Are you considering a remodel in 2018? Schedule a free 30 minute phone consultation so we can figure out that best course of action to get your remodel on the right track. Book now.